How can I kick off design thinking in my own institution? This is something I was asked by numerous colleagues after co-presenting a paper on design thinking and launching a new site, Design Thinking for Museums, at the 2013 Museums and the Web conference with Molly Wilson and Maryanna Rogers. I talked a lot about implementing design thinking inside one’s own institution with attendees in the halls of the conference hotel and over a “Birds of a Feather” breakfast. And since returning from Portland, I’ve had numerous inquiries from colleagues at institutions around the world about how to get started with design thinking, a human-centered process for innovation. The museum profession is embracing new ways of problem solving, collaborating, and innovating like never before. And perhaps that’s why the concept of “design thinking” struck a chord at this year’s Museums and the Web conference. Design thinking is mindset and a methodology for fostering creativity and solving complex problems with innovative solutions. It can transform the way a museum or cultural institution develops digital or analog offerings, visitor experiences, or visitor services by giving staff the analytical, creative, and intuitive techniques and tools to solve multifaceted problems. In the museum setting, design is usually used in the context of making objects, but design is also a process. Design thinking is a process for framing and solving problems and discovering new opportunities. It’s a powerful protocol that can lead to truly innovative outcomes. To step into into this “continuum of innovation,” there are some strategies and approaches you can implement to kick-off the process and start infusing the design thinking ethos into your work culture. Some of these are more attitudinal, while others are tactical. A mother and daughter I interviewed in the SFMoMA galleries. The power of talking to real users—from visitors to members to donors—can have a transformative impact on staff attitudes and insights. It sounds simple, but the mere act of moving from abstracted discussions about “the public” to interactions with real, live people is incredibly powerful. Spending as little as one hour a day over the course of three days interviewing visitors can lead to deeper, more nuanced understanding about the needs of visitors—and insights around how to meet those needs. At the San Francisco Museum of Modern Art (SFMOMA), where I worked for over 10 years and introduced and championed design thinking, I led a team of colleagues through in-house trainings on how to interview museum visitors for empathy. The materials, including the slide deck for an in-house SFMOMA staff training and “cheat sheets” for conducting interviews on the museum floor, are all available on the Design Thinking for Museums. The temptation to work on projects until they are “perfect” is not uncommon in most organizations, and is especially endemic in art museums, where the notion of the precious, beautiful object has a longstanding precedent. Setting time limits, even artificial ones, lowers the stakes and expectations around tangible products. For example, if you only spend one hour making a prototype, it’s hard to have the urge to cling to what you’ve designed and become overly attached to it. It’s much easier to change course and make adjustments. Bringing a scrappy prototype to a meeting or a user test frees a team from getting hung up on colors, fonts, and implementation details, and allows them to focus on the concepts. The notion of time limits applies not only to the development of prototypes, but to all phases of the design thinking process itself. By setting time limits at every stage of the process, the team is forced to keep moving forward and not get mired in details and delays. In fact, the entire cycle can be experienced in 90 minutes, as modeled in a free, open, online “crash course” in design thinking created by the Stanford d.school. The SFMOMA web team workspace, covered with images of visitors in the galleries. Saturating your space means filling your work environment with photographs, notes, and stories about the users you have observed and talked with. This makes their stories more genuine and compelling to internal stakeholders, and keeps you “accountable” and true to your users. Being constantly reminded of these real people with real needs through visual cues in one’s work space can inform your every decision. The design thinking ethos is one of openness, optimism, and collaboration. In many ways it’s similar to improv in that it’s biased towards action and focuses on building on each other’s ideas and opening up possibilities, trusting that the process will bear fruit even if the path is not always clear. In many museums it can be hard to remain upbeat as resources shrink and workloads increase, but this is a process that demands optimism and openness. This is probably the most important tactic for kicking off design thinking in one’s institution. Changing ways of working and thinking inside an organization is not easy, and it’s even harder to go it alone. Finding a colleague who is interested in trying—and failing—along with you can make all the difference. Ideally your buddy can be someone inside your own institution, but if that’s not possible, find someone at another institution with whom you can share stories and ideas. For more resources and tips around implementing design thinking in your own institution, please see the website Design Thinking for Museums. 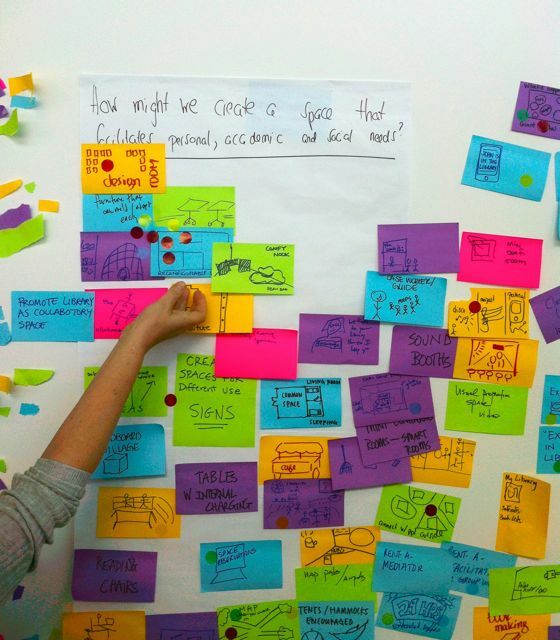 And to learn more about how SFMOMA applied design thinking to a big challenge, please read the recent Museums and the Web paper, Design Thinking for Visitor Engagement: Tackling One Museum’s Big Challenge through Human-centered Design. This article was adapted from a post originally published on www.designthinkingformuseums.net.